US, 1992, 127 minutes. Colour. Ethan Hawke, Vincent Spano, Josh Hamilton, Illeana Douglas, John Malkovich. Prologue. High on a mountain, a man reflects on the experience of survivors of a plane crash eating one another's bodies. He likens it to the Eucharist, Jesus giving his body for the life of the world. October 13th, 1972. A chartered plane carrying the Chilean rugby team home from Uruguay crashes in bad weather in the Andes. The plane breaks apart but the front is stopped by the snow on a mountainside. While a number of passengers are killed, many survive. The captain of the rugby team, Antonio, takes charge. The group tries to make the plane cabin warm and safe. They ration the food. The crash of the plane carrying the Chilean rugby team and their decision to eat the bodies of the dead in order to survive made headlines in the 1970s. 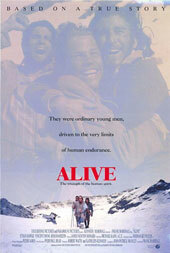 A small-budget quickie movie directed by Rene Cardona was released in 1976, Survive!. Many reviewers thought it sensationalised the events and the issue of cannibalism. British novelist Piers Paul Read wrote Alive, giving a more humane and dignified picture of the group and the decisions they made for survival. With his Catholic background, he linked the experience to a theology of the Eucharist. These themes are pesented at the beginning of this movie which was written by playwright John Patrick Shanley whose screenplays include Five Corners, Joe Versus the Volcano and his Oscar-winning, Moonstruck. John Malkovich portrays a character sitting on a mountain tope reflecting on the religious significance of the survivor's behaviour. These themes continue throughout the movie with discussions about the presence of God in the world. Schubert's Ave Maria is played at the close of the movie. The cast at the time were not big names. Ethan Hawke had appeared in several successful movies, The Goonies and Dead Poets Society, and was to become a star in the later 1990s. Others, like Vincent Spano, had enjoyed brief years of stardom. The director is Frank Marshall, a former producer for Steven Spielberg, who directed Arachnophobia and Congo. The movie is noted for its special effects for the crash landing, one of the most vivid in moviemaking. However, a great deal of the movie is taken up with ethical questions and their religious interpretations. 1.The historical event of the plane crash and the response of the survivors? Their reaction to their experience? World reaction? The book by Piers Paul Read? The film looking at the event with twenty years of retrospect? The influence of this case on further survival issues, especially food for survival? 2.The Andes locations, the mountains and the snow? The beauty? The special effects of the crash, the avalanche? Musical score? 3.The adaptation of the historical event to a dramatised form? The humane interpretation, religious interpretation? The God language, the dimensions of the presence and absence of God? The value of life? The overtones of the Eucharist and the body and blood of Christ? 4.John Malkovitch as the older Nando, the beginning and end of the film, the framing with his reflections, the experience, behaviour, the fact that no reaction was predictable, the religious interpretation, revisiting the scene of the crash, the memorial topped by the large cross? 5.The situation, the flight, the crash, audiences identifying with the characters, their experience? On the plane, the football team, their jovial behaviour, characters, jokes? The portrait of the crew? The danger arising, the visualising of the crash? 6.The themes of death, the freezing, the injuries in the crash, people trapped? The situation and people having to cope in different ways? With the mountains, with the snow, the avalanche, the temperatures, the food and the lack of food, physical and psychological injuries, emotions, the hopes for rescue? The people and the different kinds of leadership? 7.The dramatising of the reactions, the bonds between people, angers, outbursts, pain, Nando unconscious, growing fears, having to face death, the technician and trying to get equipment mended, the technician who went crazy and took the coat? 8.The fatal outlook, those who felt that they were trapped, dying? The religious response, the recitation of the Rosary? The agnostic and his trying to avoid it, his later praying? Keeping order, the disorder in the reaction? 9.The details of Antonio’s leadership, forceful personality, the rations, the cold, the search for equipment, the avalanche and deaths, finding the batteries? The seats as a toboggan and a jovial and joyful spirit? Burning them and creating the fire and warmth? Lighting hopes? 10.The range of characters: Antonio, the captain of the team, his assuming leadership, seeing the group as a team, the food, the signal to the plane, its not seeing them, people taking the food thinking they would be rescued, the growing desperation, the radio information about the search being called off, his not wanting to eat the human flesh? Roberto and his leadership, strong, taking the food with the others, reprimanded by Antonio, strong but during the final trek, cautious? The other characters, the players, their personalities, helping one another, talk to one another? Roy and his being asked to fix the radio and his being an amateur? The husband and wife, surviving, talk about their children, wanting another baby, the wife dying? The surviving husband and his being moroseness? The women and their being trapped, in pain, dying? 11.Nando and his role in the team, his being unconscious after the crash, his mother’s death, his grief when he became conscious? The decisions about the food, his speech about eating the flesh of their comrades, the reasons given? The discussion about what was civilised or not? The votes? Roberto and his eating, the changes because of what they had done, judging that surviving was best? The indication of the Eucharistic meaning of eating the friend’s flesh to survive? Jokes? Being sustained? 12.The expedition, crossing the mountains, the sense of achievement, Roberto wanting to get back, Nando and his self-assertion at the top of the mountain of what it was to be human, to be alive? The coming of the rescue team? Survival? 13.A film about the human spirit, weaknesses but mainly strengths?